Giza (/ˈɡiːzə/; sometimes spelled Gizah or Jizah; Arabic: الجيزة‎ al-Jīzah, Egyptian Arabic pronunciation: [el ˈgiːze]; Coptic: ϯⲡⲉⲣⲥⲓⲥ, ⲅⲓⲍⲁ Tipersis, Giza) is the third-largest city in Egypt and the capital of the Giza Governorate. It is located on the west bank of the Nile, 4.9 km (3 mi) southwest of central Cairo. Along with Cairo Governorate, Shubra El Kheima, Helwan, 6th October City and Obour, the five form Greater Cairo metropolis. Giza lies less than 20 km (12.43 mi) north of "Mn Nefer" (Memphis in Roman), which means "the beautiful wall" in the ancient Egyptian language, and which was the capital city of the first unified Egyptian state since the days of Pharaoh Narmer. Giza is most famous as the location of the Giza Plateau: the site of some of the most impressive ancient monuments in the world, including a complex of ancient Egyptian royal mortuary and sacred structures, including the Great Sphinx, the Great Pyramid of Giza, and a number of other large pyramids and temples. Giza has always been a focal point in Egypt's history due to its location close to Memphis, the ancient Pharaonic capital of the Old Kingdom. Its St. George cathedral is the episcopal see of the Coptic Catholic Eparchy of Giza. 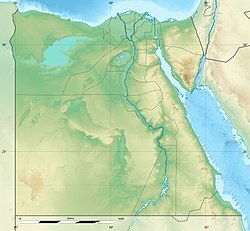 The "city" of Giza is the capital of the Giza Governorate, and is located near the northeast border of this governorate. The city's population was reported as 2,681,863 in the 2006 national census, while the governorate had 6,272,571 at the same census, without specifying what the city is. The former figure corresponds to the sum of 9 kisms. Technically, Giza may not be an incorporated municipal unit (and therefore not a city) at all. In a typical Egyptian fashion, there are two districts within the Governorate with the same name: a kism/qasm and associated markiz. Some 9 urban kisms of Giza Governorate form collectively a contiguous area of 98.4km2 directly opposite side of the Nile from Cairo, and recorded a preliminary count of 4,146,340 in 2017 census count, not including the Al-Ḥawāmidiyah kism separated by Giza markiz. It's unclear if the 9 urban kisms represent a single entity; the structure may be similar to that of 23 wards of Tokyo in that all local units are simply subordinate to the Prefecture of Tokyo without any intermediate municipal structure. Notes:2018 CAPMAS projection based on 2017 revised census figures, may differ significantly from 2017 census preliminary tabulations. The 9 kisms were reported simply as Giza city by CAPMAS in 2006 but given explosive growth definitions, likely informal, may have change or may be set to change. Giza's most famous land form and archaeological site, the Giza Plateau, holds some major monuments of Egyptian history, and is home to the Great Sphinx. Once thriving with the Nile that flowed right into the Giza Plateau, the pyramids of Giza were built overlooking the ancient Egyptian capital city of Memphis, across the river from modern day Cairo. The Giza Plateau is also home to Egyptian monuments such as the tomb of Pharaoh Djet of the First Dynasty, as well as that of Pharaoh Ninetjer of the Second Dynasty. The Great Pyramid of Giza at one time was advocated (1884) as the location for the Prime Meridian, a reference point used for determining a base longitude. Giza experiences a hot desert climate like arid climate (Köppen: BWh). Its climate is similar to Cairo, owing to its proximity. Wind storms can be frequent across Egypt in spring, bringing Saharan dust into the city during the months of March and April. High temperatures in winter range from 16 to 20 °C (61 to 68 °F), while nighttime lows drop to below 7 °C (45 °F). In summer, the highs are 40 °C (104 °F), and the lows can drop to about 20 °C (68 °F). Rain is infrequent in Giza; snow and freezing temperatures are extremely rare. The area in what is now Giza served as the necropolis of several pharaohs who ruled ancient Egypt, during the 2nd millennium BC. Three of these tombs, in the form of giant pyramids, are what is now the famed Pyramids of Giza. As ancient Egypt passed under several conquests under the Persians, Greeks, Romans and Byzantines, so did the area in what is now Giza. A Byzantine village named Phylake (Greek: Φυλακή) or Terso (Coptic: ϯⲣⲥⲱ, meaning "the fortress", modern Tersa) was located south of Giza and shouldn't be confused with it. Native Egyptians called the area Tipersis (Coptic: ϯⲡⲉⲣⲥⲓⲥ) (also Tipersis enbabylon (which most likely refers to Babylon Fortress but may as well refer to Babylon in Mesopotamia) Tipersoi, Perso), which may correspond to Persians (as the name may be literally translated as "Persians of/from Babylon"). Eutychius gives a legend about city's name and it's foundation by Artaxerxes Ochus, while Abu Salih says it was found by a Persian king Hūš at the same time as Qasr ash-Sham. As Muslims of the fledgling Islamic caliphate went on with their conquest of Egypt from the Byzantine Empire beginning in 639 AD, three years after their victory at the battle of Yarmouk in 636 AD, they conquered all of the land by the time they have captured the city of Alexandria in 641 AD. A year later in 642 AD (year 21 in Islamic calendar), they founded the city of Giza. Its name, al-Jizzah in Arabic, means "the valley" or "the plateau", pertaining to the area's topography. In addition to hospitals there are numerous medical facilities, private clinics, medical check laboratories etc. Giza shares with Cairo a subway system, officially called the "Metro (مترو)", a fast and efficient way of getting around. An extensive road network connects Giza with 6th of October City, Cairo and other cities. There are flyovers and bridges such as the 15th. Giza traffic is known to be overwhelming and overcrowded. Sphinx International Airport is scheduled to open in 2018. ^ a b "El-Giza, Egypt". Voodoo Skies. Archived from the original on 29 October 2013. Retrieved 16 August 2013. ^ "Climate: Giza – Climate graph, Temperature graph, Climate table". Climate-Data.org. Retrieved 16 August 2013. ^ "TM Places". www.trismegistos.org. Retrieved 2019-04-18. ^ Amélineau, Emile (1893). La géographie de l’Egypte à l’époque copte. Paris: Imprimerie nationale. p. 190. ^ "Trismegistos". www.trismegistos.org. Retrieved 2017-11-22. ^ Timm, Stefan (1985). Das christlich-koptische Agypten in arabischer Zeit (Teil 3 G-L). Wiesbaden. p. 1058. ^ "Ya Om El Donia. Your Uber Has Just Arrived, Cairo! - Uber Blog". Uber. 20 November 2014. ^ "Ride or Drive with Careem in Cairo, Egypt - Careem". Careem.com. Retrieved 16 October 2017. ^ Home (Archive). Cairo Japanese School. Retrieved on 2 January 2014. "NAZLET EL BATRAN EL AHRAM GIZA, A.R.EGYPT"
^ "Kontakt." Deutsche Evangelische Oberschule. Retrieved on 18 January 2015. "6, El Dokki St. Dokki / Giza"
^ "Contact Us." Pakistan International School Cairo. Retrieved on 21 April 2015. "12 Midan Tehran, Dokki, Cairo." Der Manuelian, Peter. 2017. Digital Giza: Visualizing the Pyramids. Cambridge, Massachusetts: Harvard University Press. Hawass, Zahi A. 2010. Wonders of the Pyramids: The Sound and Light of Giza. Cairo: Misr Company for Sound, Light, & Cinema. --. 2011. Newly-Discovered Statues From Giza, 1990-2009. Cairo: Ministry of State for Antiquities. Magli, G. 2016. "The Giza 'written' landscape and the double project of King Khufu." Time & Mind-the Journal of Archaeology Consciousness and Culture 9, no.1: 57–74. Khattab, Hind A. S., Nabil Younis, and Huda Zurayk. 1999. Women, Reproduction, and Health In Rural Egypt: The Giza Study. Cairo, Egypt: American University in Cairo Press. Kormysheva, Ė. E., Svetlana Malykh, and Sergey Vetokhov. 2010. Giza, Eastern Necropolis: Russian Archaeological Mission In Giza. Moscow: Institute of Oriental Studies, Russian Academy of Sciences. Lawton, Ian, and Chris Ogilvie-Herald. 2000. Giza: The Truth: the People, Politics and History Behind the World's Most Famous Archaeological Site. Rev. ed. London: Virgin. Lehner, Mark, and Zahi A. Hawass. 2017. Giza and the Pyramids: The Definitive History. Chicago: The University of Chicago Press.